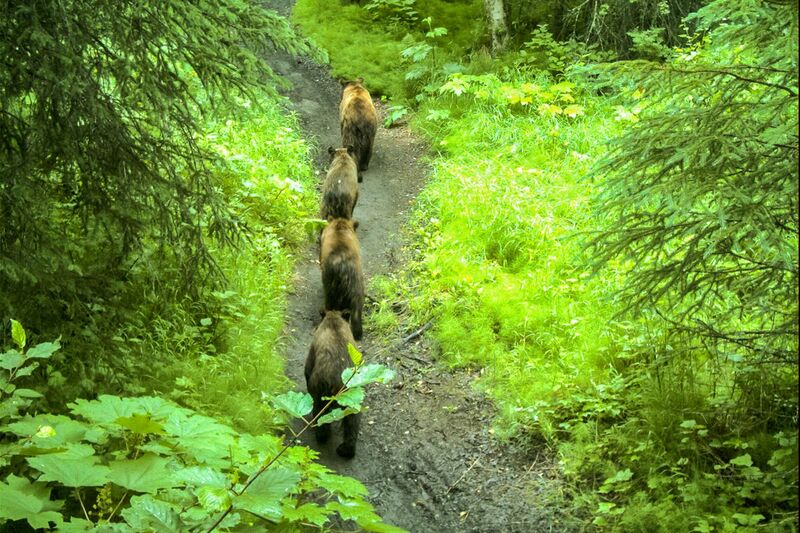 Brown bears walk down the Rover’s Run trail in Far North Bicentennial Park in an undated trail cam view provided by the Alaska Department of Fish and Game. In June 2016, Brad Treat and a companion were biking a singletrack trail in the Flathead National Forest near Montana's Glacier National Park. Rounding a corner at an estimated 20 mph, Treat T-boned a grizzly bear. The cyclist flew over the handlebars, breaking both wrists. Then he was killed by the surprised and extremely provoked bear. The final incident report completed by an interagency review board in March 2017 found that the bear acted in self-defense. Bear experts have long expressed concern that cyclists violate many of their recommendations for traveling safely in bear country. Maulings are rare, and the chances of being injured or killed by a bear while riding a bike are slim. But in several ways, biking increases your odds of injury in the unlikely event you encounter a bear at close range. And with bears just emerging from hibernation, Alaskans should pay heed. Cyclists travel much faster than hikers. Focused on the trail immediately in front of their tire, bikers tend to pay less attention to their surroundings. And a bicycle takes more time to stop than a pair of hiking boots. Runners are more like bikers than hikers in this regard, although bikes move faster than runners, especially downhill or on relatively smooth trails. Bikes are also relatively quiet. In tests conducted by Mathew Schmor, a University of Calgary graduate student, mountain bikes produced very little noise over ambient environmental sounds. A bike's noise lessens until, at 55 yards, the sound merges with ambient sounds. Schmor said his tests "dramatically illustrate how silently a mountain bike can travel on backcountry trails." Not coincidentally, most grizzly bear attacks are triggered when the bear is surprised at less than 55 yards. According to Stephen Herrero, author of "Bear Attacks: Their Causes and Avoidance," this is "the distance at which a grizzly bear is likely to react to people with aggressive action or avoidance." A bike can travel 55 yards in seconds, so bikers are likelier to surprise a bear. So why aren't more cyclists mauled? There's no easy way to figure this out, no counts or estimates of numbers of cyclists compared to hikers in bear country. Herrero, however, conducted one such analysis and found bikers, though far outnumbered by hikers, were much more likely to provoke attacks in Banff National Park. Herrero believed he had documented most, if not all, known bike-bear encounters in North America prior to 2000 that resulted in injuries. Before 2000, no cyclists had been killed, and only three cyclists had been injured in Canada and one in Alaska, all by grizzlies. In a July 2016 article in the Jackson Hole News & Guide, biker Corey Hatch claimed that officials believed Treat's collision was "unavoidable." The board of review report concluded that neither Treat nor the bear were able to avoid the collision due to the cyclist's high speed and inability to see the bear until too late. Hatch didn't seem to know about Herrero's research, but he'd combed Google and found four bear-biker incidents. Hatch warned that critics often cite such attacks as a reason for not building new bike trails in bear habitat. "Thankfully," Hatch wrote, "evidence for that particular concern is so far still scant." Unfortunately, Hatch was unaware of most biker-bear incidents, including five in Alaska. At least 20 bikers had collided with or were mauled by bears when his article was written and two additional incidents have occurred since then. I don't have details of the four incidents reported by Herrero, but I've compared the specifics of the other 18 biker-bear incidents since 2000 and several factors stand out. The heyday for black bear attacks was before the 1980s, when many national parks curtailed the practice of feeding bears. Since then, hikers are more likely to be attacked by grizzly bears, usually in surprise encounters despite the fact that black bears are 10 times more numerous than grizzlies in North America. But bikers are more likely than hikers to be attacked by black bears. Ten of the 18 encounters between bears and bikers involved black bears. Black bears tend to run, hide or climb a tree when approached by a human. However, most animals defend themselves when surprised at close range. Colliding with a bear is as close as you can get. Surprisingly, in at least five of the 18 incidents, the cyclist actually broadsided the bear. Some have speculated that Anchorage's Petra Davis collided with the grizzly that mauled her during a 2008 night-time race in Bicentennial Park because no obvious skid marks were visible and she had no memory of seeing the bear. Colliding with a grizzly, as Treat did, is likely to provoke a mauling. In two of four instances where bikers collided with a black bear, the bikers escaped with road rash, facial injuries, nothing more painful than a few cracked ribs, all spill-related. Jim Litz collided with a black bear while commuting to his teaching job in Montana but only had bruises and a busted bike to show for it. Another cyclist, David Souza, riding near Lake Tahoe, appeared to suffer no injury at all, although he was launched over his handlebars and posted a YouTube video to prove it. Besides Treat, only one other biker has been killed. Robin Kochorek was mauled by a black bear on a singletrack trail in British Columbia in 2007. Like most cyclists mauled by bears, she was riding alone and not carrying bear spray. Racing is another unique element in some biker-bear incidents. Three of the 18 incidents involved bikers in a race or training for a race. In addition to Petra Davis, Sabrina Oei was cruising downhill at 40 mph when she collided with a black bear in Colorado in 2006. Another Coloradan, Tim Egan, was traveling 45 mph downhill on a training run when he broadsided a black bear in 2008. Unlike Treat's grizzly, those black bears scampered off into the woods. Besides the three racers, 11 bikers were engaged in recreational activities. Some were mauled by grizzlies and some by black bears. At least seven of the 11 cyclists who weren't racing were on singletrack trails. These narrow, winding trails seem to pose the most significant risk to bikers in bear country. One such encounter on the Kenai Peninsula's Resurrection Trail left Tyler Nord with a punctured thigh in 2010. An extremely unusual incident took place in Chugach State Park in 2013 when Jesus Mabalot, riding slowly down Eklutna Lake Road, took the opportunity to toss barbequed meat to a black bear. He was repaid with a facial injury and scratches across his back. Other recreational incidents include Pierre Richard (Alberta, 2000), Kurt Speckhals (Wyoming, 2004), Greg Flaaten (Alberta, 2006), Anthony Blasioli (Washington, 2007), Etienne Cardinal (Alberta, 2014), and an unidentified woman near Canmore, Alberta, in 2016. Bike commuters aren't completely safe either. Four of the 18 incidents involved commuters on roads and trails. Anchorage's Sean Berkey was riding to work through Bicentennial Park in 2010 when attacked by a female grizzly with cubs. A black bear ran into John Hearn in Florida in 2011 and another may have collided with Sam Rizzo in New Hampshire in 2016 while she was riding in the dark. Both bikers escaped with minor injuries caused by crashing. Despite repeated attempts of experts to inform and educate people recreating or commuting in bear country, many of these bikers failed to take recommended precautions. Eleven of the 18 cyclists were riding alone even though it's well known that bears are less likely to attack groups of three or more. Only four of the bikers carried bear spray or rode with someone who did. In three instances the bear spray was at hand and appeared to deter or curtail the attack. In the fourth case bear spray in the biker's pack was released in the bear's face when it bit the pack. Counting on a bear biting into your bear deterrent is not a recommended procedure. There appears to be no short-term trend in the number of biker-bear incidents. Nine of the 18 incidents occurred between 2000 and 2008 and nine between 2009 and 2016. And 2016 had four incidents, the most of any year. Hatch noted that cycling advocates have spent years successfully lobbying for more singletrack trails in bear habitat, and Herrero and others have blamed the increase in biker-bear encounters on a mushrooming of backcountry trails during the past couple of decades. Although the chances of colliding with a bear are miniscule, your odds are increased by riding fast on narrow, winding trails. The Board of Review report on Treat's encounter recommended that land managers carefully assess the relative likelihood of bike-bear encounters before building singletrack trails in bear habitat and consider seasonal and other temporary closures on existing trails. The report included often-heard advice for bikers in bear country: be vigilant (bears use trails too), slow down, carry bear spray where you can reach it, make noise, don't ride alone or at night. Hatch, the mountain biker, agreed with the recommendations of the Board of Review and added "cyclists must own the responsibility" of cycling in bear country. Above all, as the recommendations in Treat's incident report advise, don't think "it won't happen to me." Be vigilant and slow down. Make noise to warn of your approach.